Lamentations pops up in the Lectionary readings for Morning and Evening Prayer this week. It must have been at least a decade, if not two, since I’ve read Lamentations, and it’s only a few pages long, so I read through the whole book: it was not at all as I remembered it! I had no memory of Lamentations being such beautiful Hebrew poetry; full of sorrow and regret. More than that however, I was surprised by the amount of feminine imagery. Jerusalem is a widow, whose former lovers do not come to her aid. She is a virgin daughter who has been defiled. There are also shocking and terrible descriptions of the devastation on Jerusalem referencing the treatment of women and children of the city: they are raped and are wholly without protection. Loving mothers cannibalise their children! The benefit of metaphors, and the reason why they are so dominant in theology and spirituality, is that the are not static. One picture morphs into another and then another, seamlessly creating a single montage. The metaphor of widow, lover and virgin daughter are not literally coherent in Lamentations, but all together the poetic impression is strong and clear. Jerusalem is vulnerable, abandoned, once loved but now unloved. Together with the Liturgy of the Bridegroom (see yesterday’s post) this got me thinking about the feminine as an archetypal metaphor for God’s people. I cannot think of a case in the Scriptures in which the marriage or lover analogy is evoked, where God is the woman and God’s people the man. The Church is feminine and the metaphor is steadfastly unegalitarian. The feminine refers to vulnerability and receptivity. Human insights regarding the social construction of gender and intimate relationships must necessarily complicate our hearing of feminine imagery and the marriage metaphor for the Church. The Bible was written in very different times to our own; which means we must retain great care not to misapply feminine imagery in our contemporary age. I’ve been watching The Tudors TV series of late, and last night I watched the beheading of Anne Boleyn: the experience of marriage is very different to contemporary Western culture indeed! I was particularly challenged at the submission of Henry’s wives to his Lordship, even unto their death. Henry is always their King as much as their Husband. As appalling as this is for me to contemplate in a human relationship, it does make sense to me in my relationship with God and in fact makes the Bride:Bridegroom metaphor work much better. We submit to our Lord God’s Love because, as husband, He has power to act on our behalf or abandon us to life without Love and protection. In worldly terms, divorce is still more often, more devastating for women than it is for men in Western societies where the laws have made concerted efforts at egalitarianism; and of course there are many places in the world where divorced women have no rights at all. As Bride, I submit to my Bridegroom’s Love, utterly dependent on His goodness and faithfulness. Any contemporary Western woman knows that this is not a passive exercise, but takes great courage and determination to choose to trust in Love. Unsurprisingly, the Liturgy of the Bridegroom directs us towards the woman who anointed Jesus with perfume (Matthew 26:6-13): an act of devoted abandonment from one who understood her Lover was about to die. It reminds me of words from Gillian Rose, ‘”in personal life, people have absolute power over one another…, one party may initiate a unilateral and fundamental change in the terms of relating without renegotiating them, and further, refusing even to acknowledge the change.” The call to relationship with God is the call to open oneself up to Love by One Who Is Trustworthy beyond any fickle man. 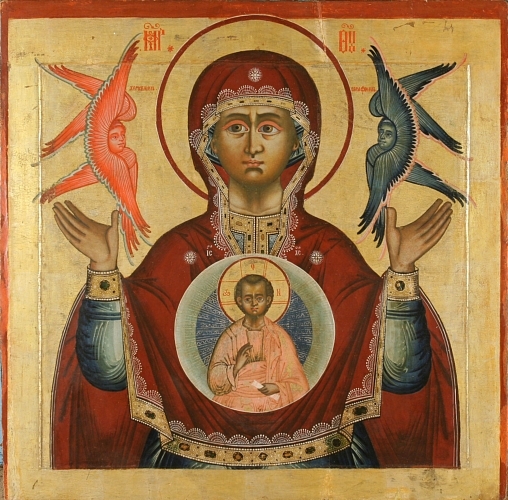 For Eastern Orthodox Christians (and many besides) the Mother of God epitomises the openness to God required by every disciple. As Mary welcomes God into her womb, we welcome God. We welcome Love into our inmost Being and we grow Love into Life with every resource of our Bodies. Not a passive abandonment but a visceral, embodied response driven by maternal instinct. Mary as Mother is our inspiration and our guide: the archetypal Lover of God. There is a distinct direction to the affection – a drawing inwards; a welcoming of that which is beyond ourselves to sink deeply into our Being. Vulnerability and receptivity. Practically speaking, this is why contemplative spirituality makes so much sense for me, though I dislike extending the metaphor of the feminine to describe contemplation as a feminine exercise. What doesn’t make sense to me is why the church as it exists in reality (as opposed to theology) is so dominated by masculine modes of being. We push outwards with our evangelism, ‘winning others for christ;’ making ‘strategic growth’ plans for our parishes, insist on hierarchy, bureaucracy, institutionalism and unquestionally accept impersonal relationships with our brothers and sisters in Christ. The conception of ‘ministry’ has been masculine for the bulk of the church’s history and the reception of non-masculine priests continues to be a struggle for much of the institutional church. In other words, the church in practice looks more like the powerful Husband/Lord than the vulnerable Bride. I feel powerless to respond to this observation in any other way than prayer. I can take responsibility for my own turn inwards towards God, but I cannot affect anyone else’s. All I can do is open myself up to Christ’ Passion, one day at a time, and let God do the rest. I am finding the need to qualify my own reflections here: these ponderings on the feminine are but one aspect of a sophisticated web of questions regarding gender and spirituality. Prodigal Kiwi has recently posted on Masculine Spirituality with some links to Richard Rohr podcasts, which nicely complicates my mind on these matters. Chelle – thanks. I was at a lacture last week questionaing whether Hamlet could have been a woman (with reference to the fact that Hamlet is supposed to symbolise the human condition, and if we can’t imagine him as female then that whole thesis is flawed). I had already thought about whether we can pose the same question about Jesus. Your thoughts about the church are connecting with these ideas & I’m interested to see where it goes! Thanks Mel. I think the question I’m a bit stuck on is how to extricate oneself from metaphors before they get extended too far. I think Luce Irigaray might be able to help me with this question (French feminist worth a google search if you don’t know her) but I’m waiting for the right time to read more of her!